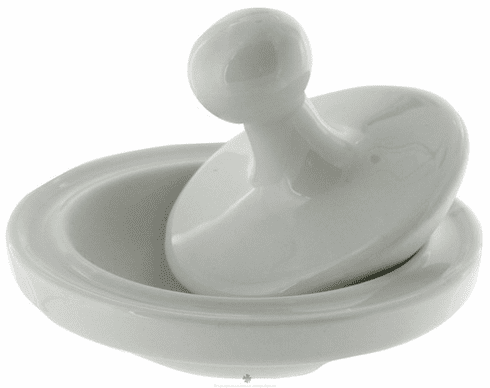 Harold Import CompanyÍs Flying Saucer White Porcelain Mortar and Pestleæis perfect for powdering herbs and crushing pills, as the pestle spans the entire width of the mortar. The workmanship here is excellent and have been the same quality product from the same manufacturer for 20 years. This is the original flying saucer mortar & pestle. When developed 20 years ago, HIC nicknamed this the flying saucer for its unique shape and design. A rough well in the center of the dish and a rough bottom to the pestle facilitate the grinding of herbs, spices, nuts or pills. The porcelain design makes this perfect for clean up and you wonÍt have to worry about retaining flavors. Also, its unique design makes for good dinner conversation! Approximately 4"